GOES-13 was placed in standby after experiencing an anomaly on Sunday, so all GOES-R IFR Probabilities are being computed with GOES-West data; GOES-15 is in FD mode, acquiring a full disk each half hour to provide coverage for CONUS. GOES-15 data did detect the development of fog/low stratus over southern/coastal Texas and Louisiana overnight under the presence of light winds and high dewpoints. The regions of highest probabilities correspond well with IFR conditions. The 1330 UTC image, at the end, shows a noticeable drop in coverage as the daytime predictors replace the nighttime predictors (this includes using the visible imagery as a cloud mask). This entry was posted in MODIS, Texas on September 24, 2012 by Scott Lindstrom. In regions where very small-scale terrain effects low cloud distribution — for example, in river valleys — the superior resolution of MODIS (on Terra or Aqua) or VIIRS (on Suomi NPP) allows a much better horizontal definition of cloud boundaries. In regions of larger scale variability, such as over the ocean, differences between GOES and MODIS IFR estimates aren’t quite so noticeable, as in the imagery above. Both fields show a large region of low stratus over the northern Gulf of Alaska moving inland. The regions of lower ceilings and reduced visibilities match the stream of higher IFR probabilities moving northward over the Gulf, from Middlteon Is (PAMD) on the western edge to Sitka (PASI) and Petersburg (PAPG) on the southern/eastern edge. Note also the break in high IFR probabilities where the Aleutian Peninsula attaches to the mainland, with higher probabilities, and IFR conditions, at PASV (Sparrevohn). The character of the IFR probability field should alert you to the presence of a stream of high clouds over the western third of this image. In that region, only model values are being used to compute IFR probabilities, and the total probabilities are therefore lower. This entry was posted in Alaska, MODIS on September 20, 2012 by Scott Lindstrom. 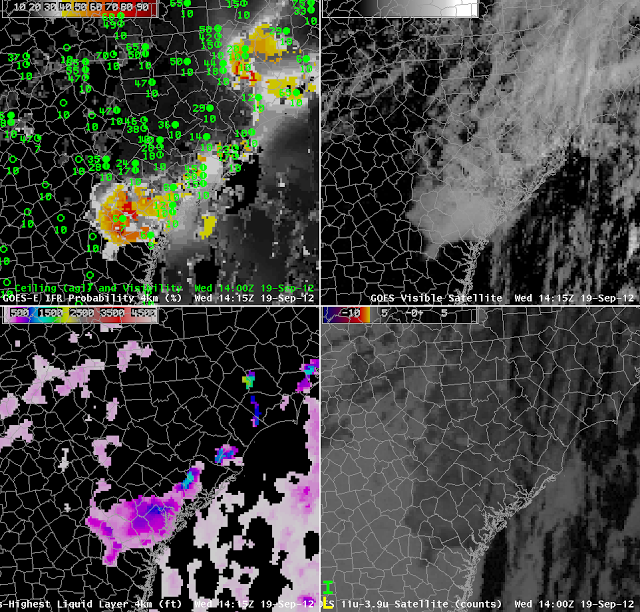 GOES-R IFR Probability gives information in the day too! The GOES-R IFR Probability serves a useful purpose in the day: It highlights where, in a field of clouds, the lowest visibilities and ceilings are likely. In the image above from coastal North and South Carolina and Georgia. 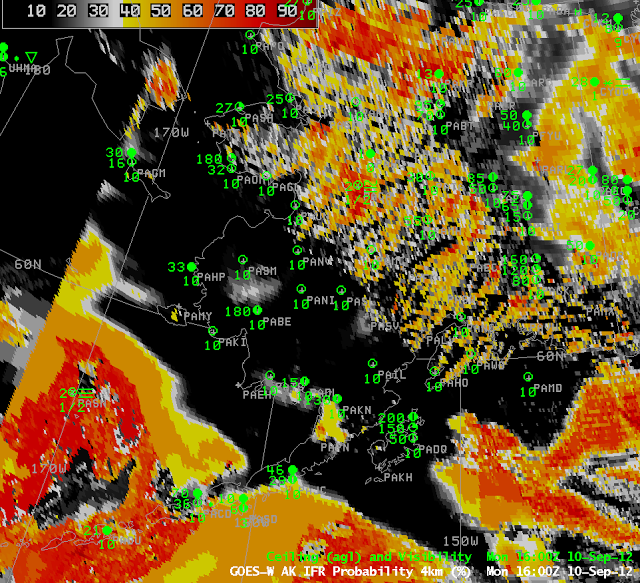 cloudiness is hugging the coast, as indicated both in the visible and in the tradiational brightness temperature difference product. Highest probabilities of IFR conditions are depicted near Statesboro and Savannah GA, where ceilings and visibilities are lowest. This entry was posted in Cloud Thickness, Day/Night Boundary, Southeast on September 19, 2012 by Scott Lindstrom. 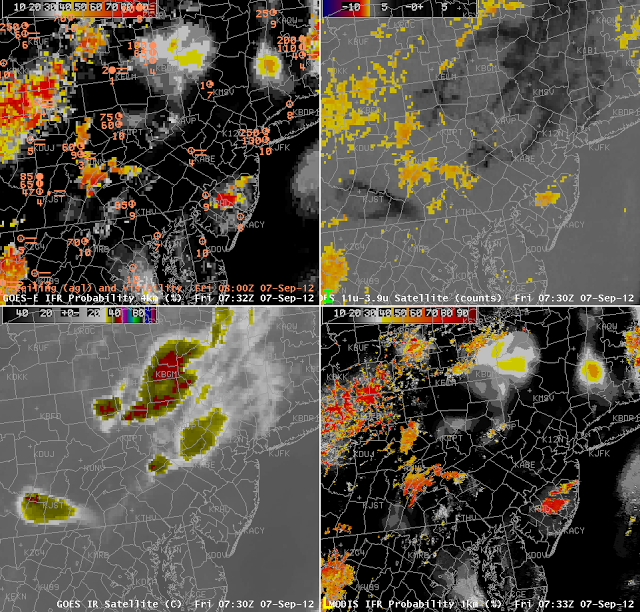 GOES-R IFR Probabilities over Pennsylvania and surroundings hourly from 1300 to 1700 UTC on 18 September 2012, with ceiling and visibility plots overlain. The traditional method for identifying fog and low stratus, the brightness temperature difference between the 10.7 µm and 3.9 µm channels, cannot work in cases with multiple cloud layers, or in cases with cirrus. Such a cloud environment is increasingly common in cooler weather months as extratropical cyclones and frontogenetic events cause large-scale ascent. It is still important to have a way to identify regions of low clouds/fog, and the fused product that considers both satellite data and rapid refresh model data accomplishes that task. When only model data are used in the fused product, IFR probabilities will peak around 55% — the dark orange shading that is comon over much of central Pennsylvania — to 67% — the isolated pockets of darker red/orange over western Centre County. Higher values — such as the red values over the lower Susquehanna Valley — exceeding 75% require both a satellite and model estimate (there is likely a gap in the high-level cloudiness here that allows the satellite to view the lowest clouds). As the thick overcast over Pennsylvania breaks apart during the course of the morning in this animation, the IFR probability field takes on a more pixelation aspect and regions of high IFR probability appear. Again, highest probabilities occur in regions where both satellite and model suggest IFR conditions are present. When satellite data are not available, IFR probabilities will not be so high. Note in this animation that southeast Pennsylvania and New Jersey, where visibilities/ceilings exceed IFR thresholds, are regions where IFR probabilities correctly remain low. This suggests that the Rapid Refresh model is accurately simulating the evolution of the weather system. This entry was posted in Mid-Atlantic, Multiple Cloud Layers on September 18, 2012 by Scott Lindstrom. Low clouds and fog are a climatologically normal feature of the Pacific Ocean off the coast of California, abetted by the upwelling of cold water there. It’s also common for those low clouds and fog to spread inland over the course of the night, and the animation above shows how the IFR product handled the evolution of the low clouds during early September. There are several sites where IFR conditions develop as the IFR probability field values increase: Hollister, CA (KCVH), South Santa Clara County Airport (KE16), Hanford (KHAF) and San Francisco International (KSFO). Monterey, Salinas and Watsonville (KMRY, KSNS, KWVI) spend the night in IFR conditions, and a tongue of higher probabilities extends down that Salinas Valley as well. At 1500 UTC, the sun has risen, and cloud detection allows the elimination of many IFR Probabilities in regions where — at 1500 UTC — any fog/low clouds that developed over night have dissipated. This entry was posted in California on September 11, 2012 by Scott Lindstrom. IFR Probabilities and how they trend with time can help a forecaster determine the most likely regions where IFR conditions are occurring, and where they may occur in the near future. The animation above illustrates several key facts about the product. The region over interior Alaska is one where both Rapid Refresh model data and satellite imagery are being used to produce the IFR product. This is related to the pixelated aspect of the field in that region. The high probabilities at the top of the image correspond to the location of the Brooks Range — higher topography there means IFR conditions are more common as the terrain rises into any low clouds that are present. There is a region of modest IFR probabilities over the Bering Sea north of the Aleutians and west of the mainland. These values are relatively low (orange and yellow color), and uniform, because they are computed with the Rapid Refresh data only. There is a region that moves in from the western edge that includes satellite data as well, and that is reflected both in the increased pixelated look to the field, and in the higher probabilities. (Note that St. Paul Island — PASN — is reporting IFR conditions during this time) When model data only are used in the computation of GOES-R IFR Probabilities (as occurs, for example, in regions of multiple cloud layers, or where a single high cirrus deck is present), probabilities are lower than in regions where satellite data also is used. Very high probabilities occur only where satellite data can be used to gauge IFR probabilities. Note also in this image that the western edge of the Rapid Refresh domain is obvious, west of 170 W longitude. Note that in the inland region of enhanced IFR probabilities, Galena AK is near the highest values, and it is experiencing reduced visibilities and IFR conditions with freezing fog at 1400 UTC. Those conditions continued through 1600 UTC (below). This entry was posted in Alaska, Terrain on September 10, 2012 by Scott Lindstrom. DENSE GROUND FOG CONTINUES TO BE POTENTIAL PROBLEM OF THE NIGHT. IN MANY OF THE ZONES AND THE SHOWERS HAVE ENDED IN DE. START GETTING TO 100 PCT RH IN S NJ/DE. DEPOSITION (WHICH IS QUITE HEAVIER) IS TAKING AWAY FROM THE FOG. THE GRIDS, BUT STOP THERE. The GOES-R IFR Probability product, shown below at hourly intervals starting at 0315 UTC, shows modest probabilities of fog over the Delaware Valley, and higher probabilities over the Pine Barrens of central New Jersey, justifying the forecast mention of patchy fog. MODIS data can be used to compute IFR probabilities. One comparison scene exists at the beginning of the hourly loop, and the finer detail over the valleys of southeast Pennsylvania is evident in the 0322 UTC image. The MODIS image at 0739 UTC shows (below) similar fine-scale structures that can help a forecaster fine-tune the forecast. IFR probabilities in the MODIS images definitely jump over central New Jersey between 0322 UTC and 0733 UTC. Such a notable change is a tool for a forecaster to be alert to the possibility of fog/low stratus and IFR conditions. Several stations in central New Jersey, including McGuire Air Force base (KWRI), Belmar/Farmingdale (KBLM) and Mill Valley (KMIV) did report borderline IFR conditions between 0700 and 1000 UTC. This entry was posted in AFD, Mid-Atlantic, MODIS, Multiple Cloud Layers on September 7, 2012 by Scott Lindstrom. Oceanic storms will generate IFR conditions, and the GOES-R IFR Probability fields, a fused product that blends satellite and model information, provides an indication of how and when visibilities decrease. The animation above, at hourly intervals, shows the steady advance of higher IFR probabilities eastward through the Gulf of Alaska. Note how the observations at Middleton Island (PAMD) and at Yalutat (PAYA) both transition to IFR conditions as the ‘front’ of higher probabilities passes — around 0700 UTC at PAMD and around 1300 UTC at PAYA. The IFR probability field includes regions that are characteristic of model-only predictors being used (the large yellow region that stretches NNE-SSW over the Gulf of Alaska at 1200 UTC) and regions where both model and satellite data are used (the more pixelated region south of the Aleutians at the end of the animation). When model predictors only are used, probabilities are typically lower than when both model and satellite predictors are used. This entry was posted in Alaska, Multiple Cloud Layers, Terrain on September 5, 2012 by Scott Lindstrom.